Inside Out are a new Australia-wide grassroots group aiming to build a network of LGBTIQ people both inside and outside prisons. 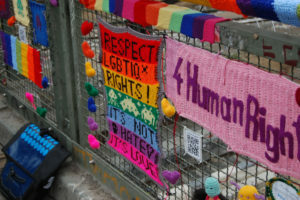 Incarceration can be an isolating experience for LGBTIQ people. We want to create a sense of community across the walls, amplify the voices of prisoners and provide access to information, community news and resources. We will be producing a quarterly newsletter with content by and for LGBTIQ people (and allies) who are incarcerated. This will include artwork, poetry, letters and articles by prisoners and former prisoners, as well as news from the LGBTIQ rights movement. A resource list of prisoner advocacy and support organisations will also be included in each addition. If your organisation is able to provide any services to people in prison and you would like to be listed in the resources section of the newsletter, please let us know and send us a very brief description of what services your provide to prisoners and how they can contact you. We will also be compiling a list for our website of organisations and groups that can people can access once they are out of prison, so let us know if you would like to go on this list also.